With over 23,000 apps in the Windows Phone Marketplace and more expected with the release of Mango, you might find it increasingly difficult to find apps. Thankfully, Microsoft recognized this and have made some pretty significant changes. Under the current version of Windows Phone called NoDo, you would swipe left and then up to scroll through your apps. As you increase your stable of apps, this can become a very cumbersome process. With Mango Windows Phone 7.5, they have made a simple, yet effective change to how you search apps. From the home screen, you swipe right and it reveals your list of current apps and also your phone settings. New to Windows Phone 7.5 Mango is the magnifying glass. Select this and you can easily search and launch your applications. You won’t have to type out the entire name of the application. In addition, it will secondary names based upon your input. For example, if I type ‘Mo’, it will generate a result of MoTweets and AT&T U-verse Mobile. Let’s say that you recently switched to a new Windows Phone and you search for an application that you purchased, but is no longer on your handset. There is an option to search the Marketplace, so you can easily find and download to your new phone. Interesting Mango Beta Factoid: During the beta period of Mango, there was an option to select a letter of the alphabet and it would bring up apps that started with that letter. This was a carryover from the Zune software. We’re sad to see it go, but you can certainly see the expanded utility of the search feature for finding apps. When you complete your search, press and hold to reveal a contextual menu that allows you to ‘pin to start’, ‘rate and review’ or ‘uninstall’. 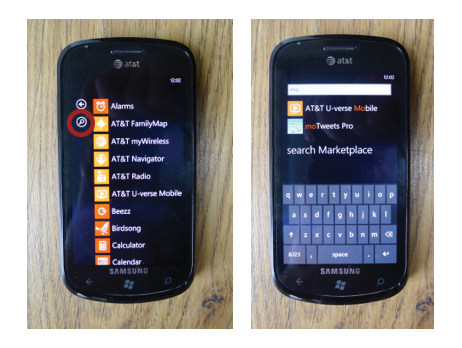 All in all, the new search feature in Windows Phone 7.5 Mango makes it easy to search and find apps. Nice article but ur comment about Mango Beta is inaccurate where u mentioned that u could search for apps by letter as u can in the People Hub. U can do this in the RTM version of Mango (which I’m running on my HD7) but have to have over 50 apps installed before the option shows up. This was actually noted in a review of Beta 7712 about 3 weeks ago. Thanks, that’s great news. I enjoyed the option on my Zune and was a bummed when I didn’t notice it in 7712. I’ll update the article.